The Golden State Warriors' Klay Thompson last night had what I think can fairly be called the greatest single quarter of NBA shooting ever, as his team routed the visiting Sacramento Kings, 126-101. It's not just that Thompson set the Association record for most points in a quarter -- 37 in the third -- but how he did it. He simply didn't miss. He hit all 9 three-pointers he tried, all 4 two-pointers, and both free throws. Based on this play-by-play sheet of the third quarter, I've graphed Thompson's shot sequence according to time left in the third quarter. You may click on the graphic to enlarge it. 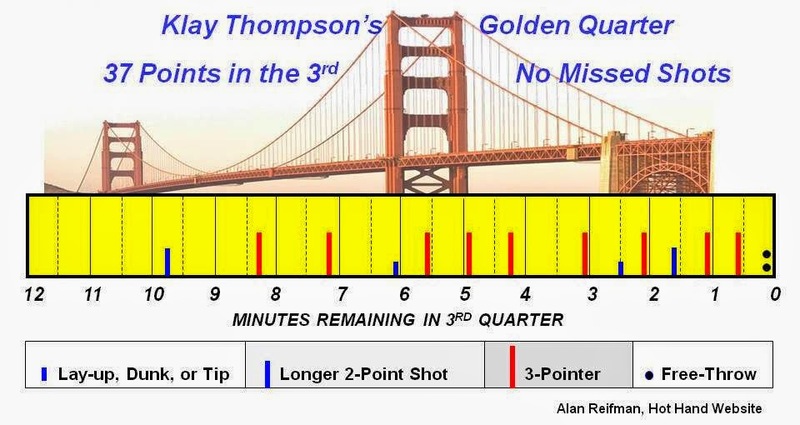 As can be seen, Thompson didn't even begin his third-quarter scoring until 2:16 had elapsed (i.e., the 9:44 mark). Further, he scored 29 of the 37 points from the 6:03 mark in. Twenty-nine points in (roughly) six minutes would translate to 232 points in a 48-minute game! For the record, Thompson scored "only" 52 points on the night (including 11-of-15 from behind the arc). There were two short stretches (5:31, 4:56, and 4:18; 1:06 and 0:35) in which he was hitting a three approximately every 30 seconds. Thompson entered the game with a three-point shooting percentage of .444 this season. The probability of a 9-for-9 quarter shooting threes would be .444 raised to the 9th power, which is .0007 or 7-in-10,000. However, we are asking this question after the fact, knowing the probability is likely to be very low. Using this binomial calculator, we can also examine the less extreme (although still post hoc) question of how likely a .444 shooter would be to hit 11 (or more) out of 15 three-point attempts in a game. The answer is .02 or 1-in-50. One of the biggest upsets of the current men's college basketball season occurred this past Sunday, as unranked North Carolina State handed No. 2 Duke its first loss, 87-75. Key to the Wolfpack's win was the three-point shooting of two upper-year guards, senior Ralston Turner and junior Trevor Lacey. Turner hit three three-pointers in a little over two minutes (between 16:58-14:48) during the second half, to help NC State maintain a narrow lead. A bit later, Lacey hit a couple of threes and a two during a 22-5 run as the Wolfpack expanded a 50-48 lead to a 72-53 advantage (play-by-play sheet). Duke rallied some, but couldn't catch up. 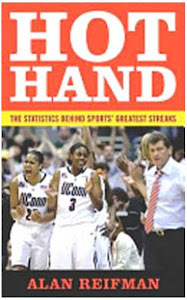 Turner ended up 4-of-7 from behind the arc during the day, whereas Lacey went 5-of-7. As it turns out, these guards' long-range success has been building over the past month. In the following graph, I show Turner and Lacey's three-point shooting percentage game-by-game this season, with the larger basketball data-points (orange for Turner, red for Lacey) reflecting greater numbers of three-point attempts in a given game. You may click on the graph to enlarge it. The graph should be read from bottom to top, in thin slices. In the Wolfpack's season-opener against Jackson State (JSU), for example, Turner shot 1-of-4 (.250) from behind the arc, whereas Lacey shot 3-of-5 (.600). If you're an NC State fan, what you want to see are large-sized basketball icons high up in the graph, meaning that a player launches a lot of three-point attempts and makes a healthy share of them. Turner has indeed provided several large orange basketballs, shown in the shaded area representing shooting percentages between .400-.700. Against Tennessee, in fact, Turner made eight treys on an amazing 17 attempts, a .471 clip (click here for Turner's game-by-game log). Lacey doesn't necessarily shoot many threes in a game -- indicated by the relative dearth of large red basketballs -- but when he fires from downtown, he frequently hits. In six of his last eight games, he has shot .500 or better from behind the arc (click here for Lacey's game-by-game log). 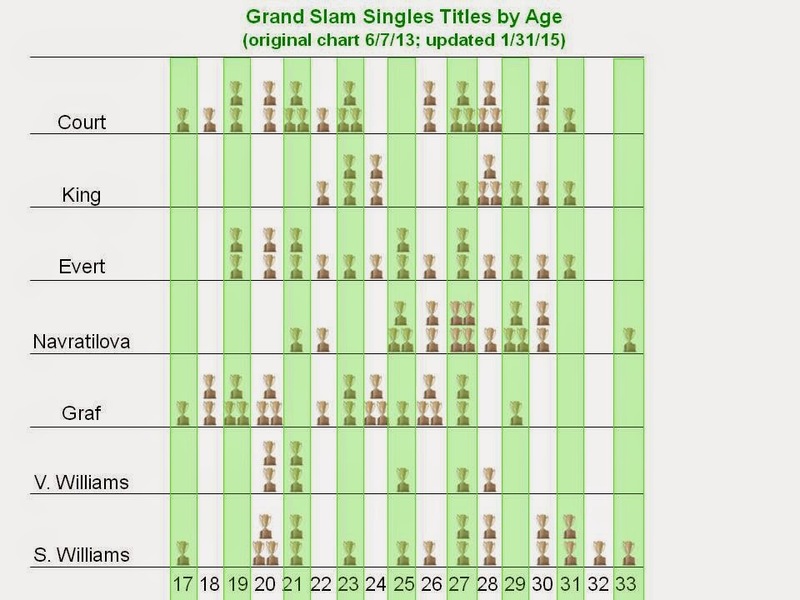 Two additional trends are worth noting. First, for the past month, cold-shooting games have been very rare for Turner and Lacey (see the blue notation on the graph). Second, the two players' shooting accuracy from game to game appears to be correlated. The good news is that, if one of them is shooting well in a game, the other tends to be, also. The bad news, however, is that if one is shooting poorly, so is the other likely to be. 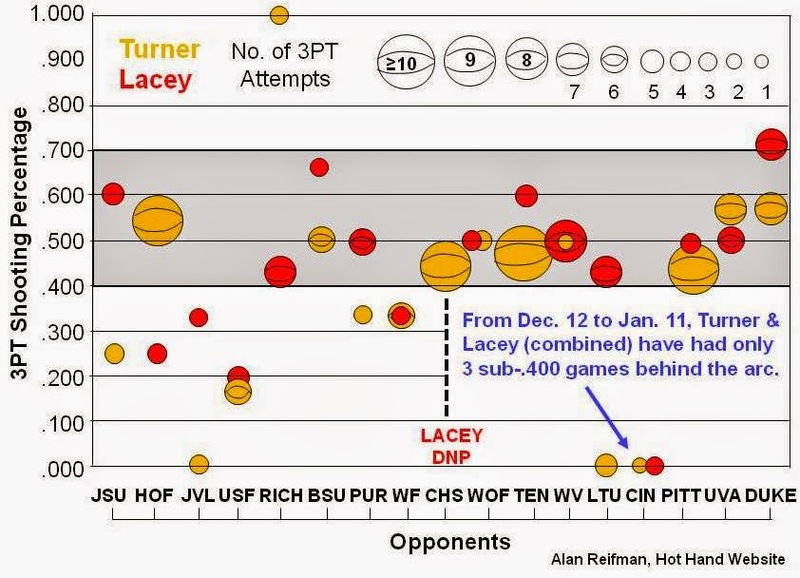 For those with some statistical training, the Pearson correlation between Turner and Lacey's three-point shooting percentage is .45 (where 1.00 is the maximum). It's possible a sort of "contagion" operates between Turner and Lacey, where one player's shooting level in a game (good or bad) rubs off on the other. Another possible explanation is that good defensive teams shut down both Turner and Lacey, and bad ones let both of them shoot the deep ball well.